With new service from Boston (BOS) and Baltimore (BWI), northeastern travelers can conveniently take advantage of WOW deals. Update: At the time of this review, WOW Air allowed free stopovers at KEF, however that’s no longer the case. 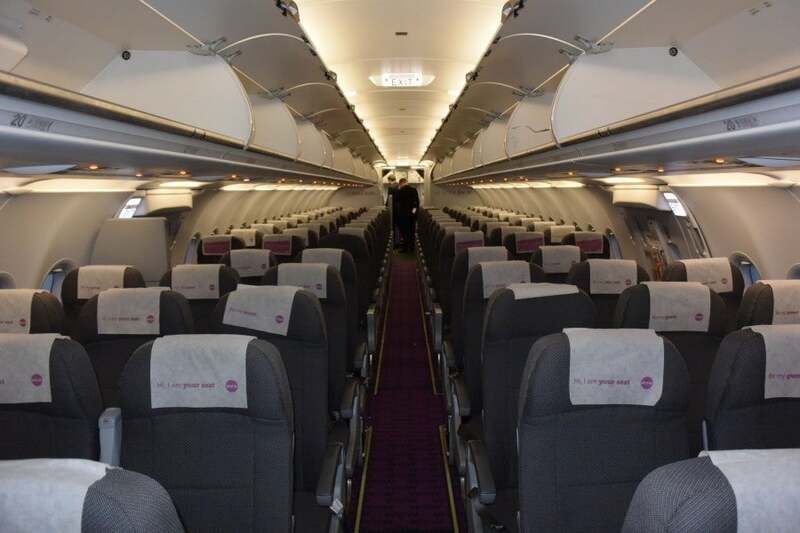 Though you might not consider an Icelandic carrier as an option for travel from Baltimore (BWI) and Boston (BOS) to other parts of Europe, WOW Air now offers service to London, Paris, Dublin, Copenhagen, Berlin and more. Many of the low-cost carrier’s European destinations include layovers in Reykjavik’s Keflavik Airport (KEF), allowing you to increase the value of your fare with a side trip to The Land of Fire and Ice. The $99 one-way flight to Iceland recently featured on TPG inspired me to kick off my summer with an exploration of Iceland, so I booked round-trip flights for myself and a companion from Boston’s Logan Airport (BOS) to Reykjavik’s Keflavik Airport (KEF). 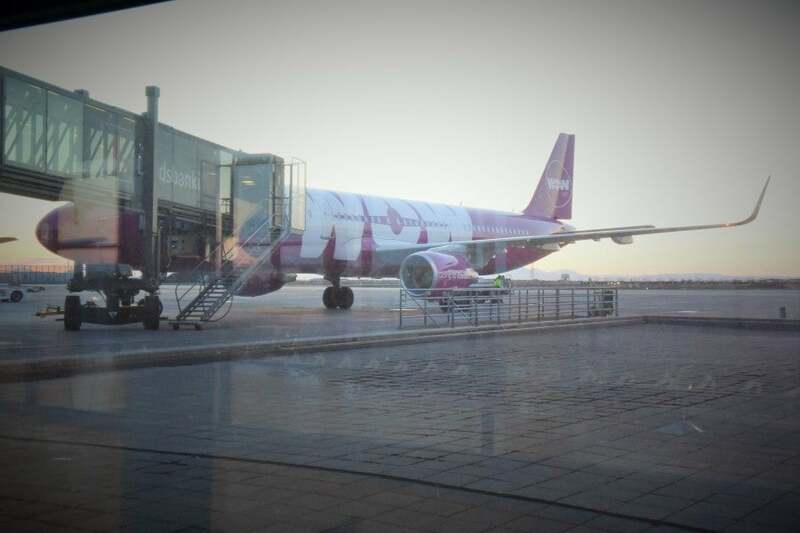 While all WOW Air flights stop in Iceland, the low-cost carrier flies to many other destinations in Europe. Tickets and taxes represented only $526.78, while $96 covered the cost of one checked bag weighing 20 kilograms (about 44 pounds). I used the Barclaycard Arrival Plus World Elite Mastercard to pay for the flight in order to take advantage of the World Mastercard travel benefits, as well as to utilize the 40,000 miles I’d recently earned from my sign-up bonus. After the charge appeared on my statement, I used 40,000 miles (equal to $400 in statement credits toward travel) to effectively take the cost of tickets down to $222.78. It bears mentioning that the online booking interface was easy to navigate, and I was emailed a booking confirmation instantly after payment. WOW’s fare calendar makes it easy to see the lowest-cost flight options; flights from Baltimore-Copenhagen are as low as $193.99 one-way. WOW’s fare calendar allowed me to view relevant dates and prices. It’s important to note that, because of WOW’s limited service, it’s typical for only one flight to be available each day. A decent amount of flexibility is required to find a flight that fits within your schedule. Both my departure and return flight on WOW were less than 75% full — which meant quick check-in lines and plenty of space to spread out. WARNING: Unfortunately the locations listed on the WOW site aren’t completely accurate. For example, Washington, DC, actually refers to Baltimore (BWI), which is technically an hour away from the nation’s capital. Be sure to check which airport you’ll be flying from, rather than relying on which city is stated. The WOW team at KEF let my checked bag fly with an extra 1.2kg of weight — but no such luck at BOS, where weight limits were strictly enforced. Like other low-cost airlines, WOW bolsters its revenue by charging extra fees for baggage, seat selection and a variety of in-flight services. Purchasing extra baggage, it turns out, can be rather complicated. Included in the price of your fare is one small cabin bag which can weigh up to 5 kilograms (about 11 pounds) and can be no bigger than 56 x 45 x 25 centimeters. If you want to bring more than 5 kilograms to Iceland, though, you’ll have to shell out some extra cash. By paying $29 each way, you can purchase 7 kilograms (15 pounds) in extra weight for your carry-on bag, netting you a weight allowance of 12 kilograms (26 pounds). If 26 pounds isn’t enough, though, you’ll have to purchase a checked bag for $48 each way. This will give you a total baggage allowance of 20 kilograms (44 pounds). On the departure flight from Boston (BOS), the check-in crew was very strict with weight limits. 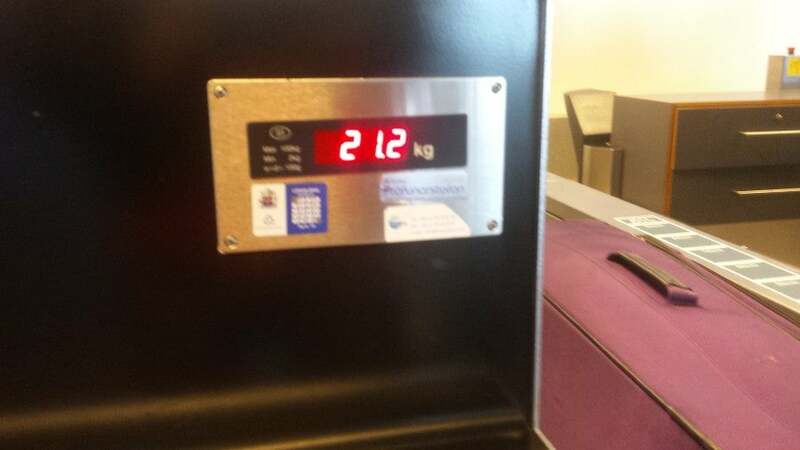 On my return flight, however, the crew at KEF checked my bag weighing in at 21.2 kilograms (46.7 pounds) without charging me any additional fees. 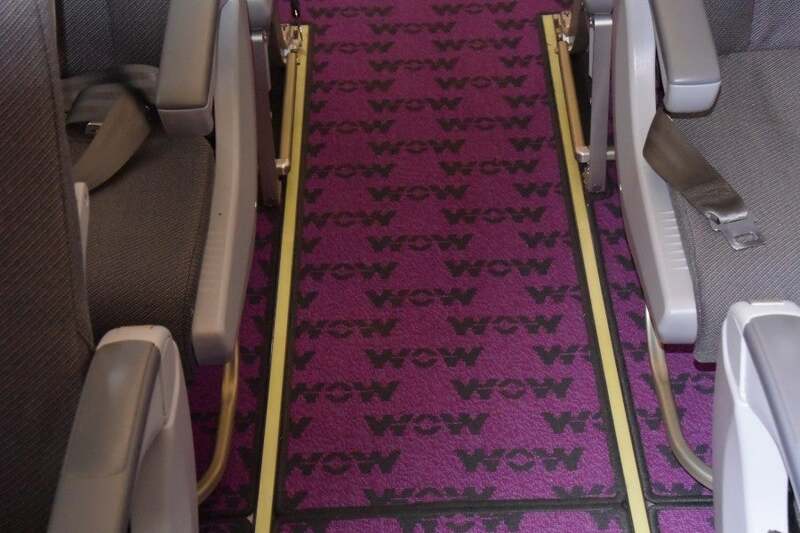 Company branding is everywhere on a WOW flight, including on the custom carpets. Fortunately, the staff was not strict at all about carry-on items, allowing me to bring both my carry-on bag and a shopping bag full of purchases, the latter of which I stowed beneath the seat in front of me. Of course, you can’t count on all WOW staff being equally lax about carry-on policies, so don’t plan on bringing two huge bags per person or anything. 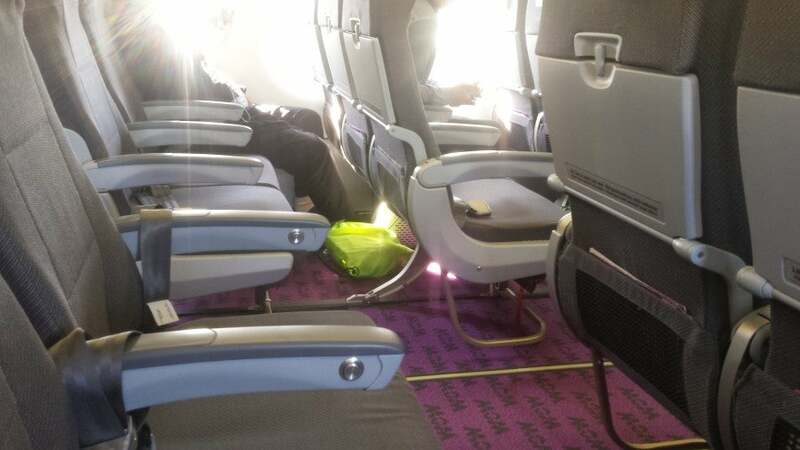 The XL seat from WOW Air offers some extra space during the five-hour flight. For both my departure and return flights, the entire check-in, security and boarding process was incredibly smooth and efficient. Each plane was less than 75% full, and it was a pleasure to have extra space for my carry-on items and myself. The WOW plane was clean and the staff was friendly. Aside from that, though, no complimentary amenities were afforded. The planes themselves were clean, trendy and pretty darn comfortable, but you should still prepare yourself for a truly no-frills flight. Aside from the perks of the plane’s cushy seats, whimsical decor and friendly staff, you should be ready to take out your wallet for just about everything. So what is included? Absolutely nothing. I was placed in one of the XL seats on my return flight from BOS>KEF. Now that the carrier has introduced its new A321 aircraft, its A320 is usually reserved for short-haul flights between Iceland and other European destinations, but both my BOS-KEF and KEF-BOS flights were aboard A320s. The aircraft is arranged in a 3 x 3 configuration of all-economy seats with 30-31 inches of pitch and 17 inches of width, with extra-legroom “XL” seats in rows 1, 12 and 13. The ability to choose your seat will cost you $5 each way, while an upgrade to an XL seat will set you back $33 each way. If you’re the kind of person who enjoys extra space, you can upgrade to an XL seat either online at the time of booking or at check-in, subject to availability. At 5’ 11,” I found the economy seat to be adequate for the five-hour flight to KEF, but on my return flight home to BOS, I was happily placed in an XL seat for no additional charge — so hey, you can live in hope. The WOW vomit bag showcases the extent of in-flight entertainment — which is nothing. Neither Wi-Fi nor in-flight entertainment were available for flight passengers, so be sure to bring along your own pre-downloaded (or actual paper) distractions. 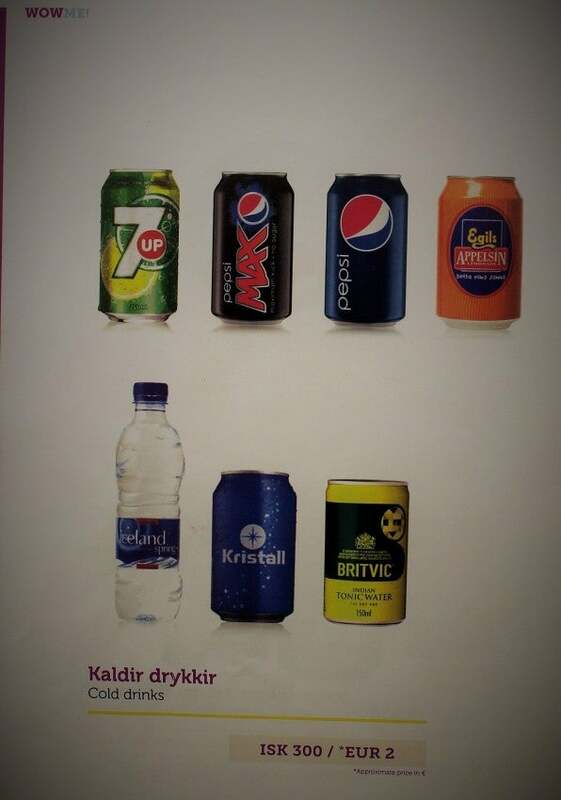 Nothing is free on a WOW Air flight. The least-expensive option for water will set you back more than $2. WOW has an extensive catalog of in-flight services, including food, drink and an entire duty-free mall, all of which come at a price. After asking an otherwise accommodating flight attendant for a glass of water, I was informed that even that wouldn’t be complimentary. The least expensive option would be to purchase a bottle of Iceland Springs water at a cost of 300ISK (roughly $2.25). After purchasing two slider-sized cheeseburgers at a cost of 1400ISK ($14USD), I can confidently recommend that you buy all of your food at the departure terminal prior to boarding. The quality of each cheeseburger was disturbingly low, with a “beef” patty whose texture was comparable to cardboard, set on soggy bread and wrapped in a clear plastic bag. Basically, if you’ve ever had a burger at a convenience store, you’ve pretty much already had the WOW Air burger experience. Maximization tip: Although the in-flight magazine shows prices in both ISK and EUR, it’s important to go by the USD conversion from ISK. Otherwise, the overstated euro value may lead you to think that the in-flight prices are fairly cheap. WOW plane at Keflavik International (KEF). 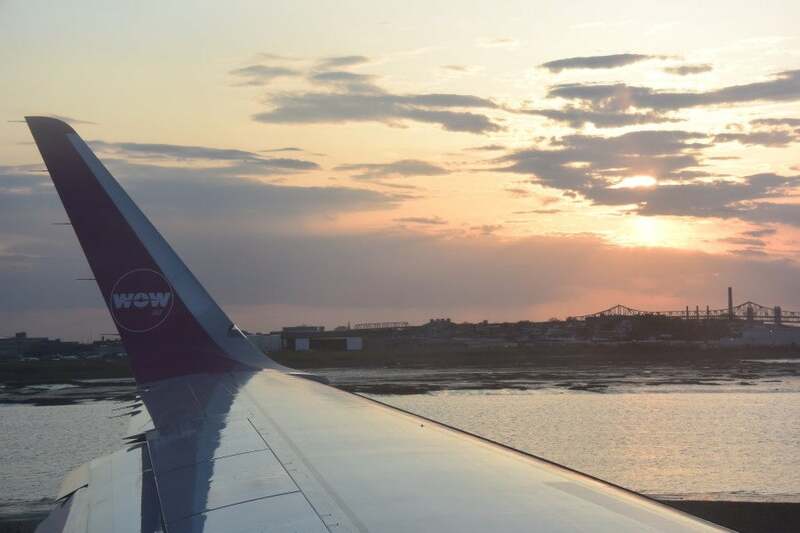 Trendy, low-cost WOW Air is a great option for an inexpensive trip to Iceland or Europe — just be sure to eat and drink ahead of time and come prepared with stuff to do. Inclusiveness and fun seem to be at the forefront of the carrier’s efforts, and can be seen in the quirky purple WOW Air carpets and flight attendant uniforms, and cheeky phrases printed throughout the planes, including “Only cool kids sit at the back” and “Honk if you’re hungry” (except don’t, because the food is terrible). The friendly, helpful flight attendants on WOW Air wear these fun purple uniforms. 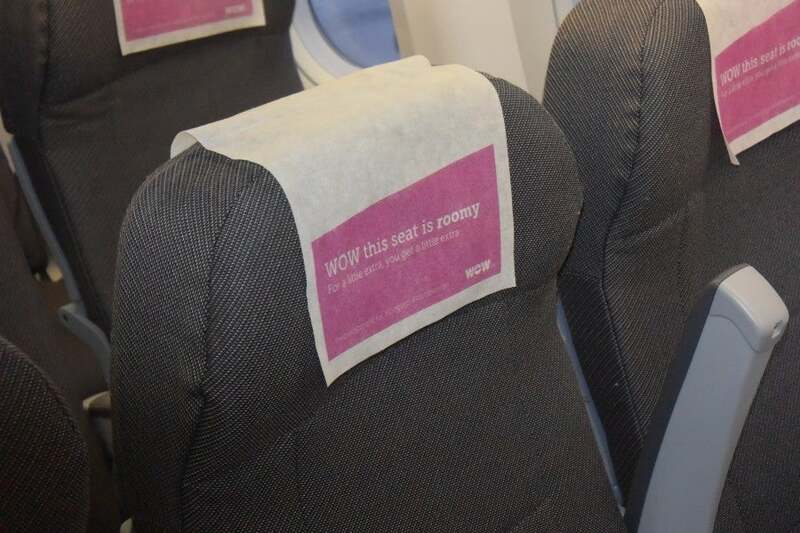 Photo courtesy of WOW Air. All in all, I was extremely satisfied with the service I received on both of my flights. The flight attendants, dressed in classy pink-purple outfits, always smiled when answering my questions about the sometimes-confusing fees, and upon arrival at KEF, were more than happy to help me navigate around the airport. 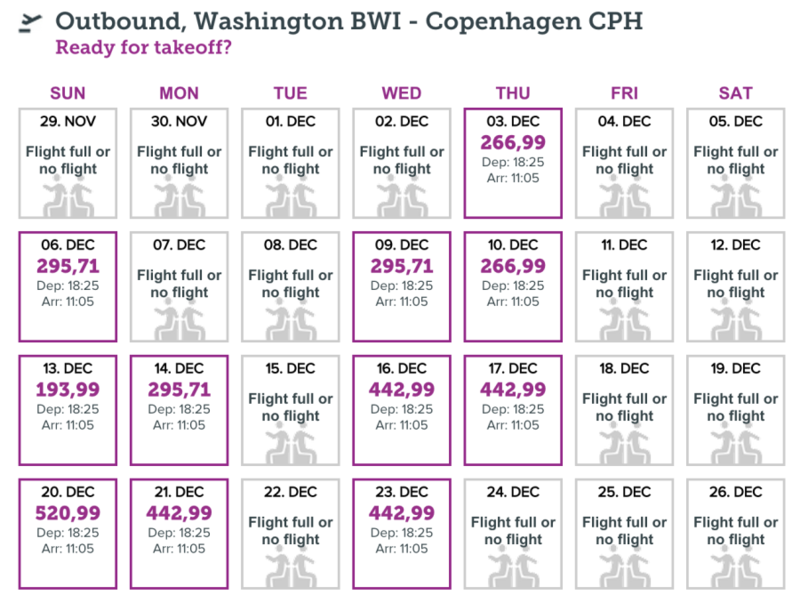 Round-trip flight prices on WOW Air from BOS to CDG over the next several months. Currently, WOW Air deals to Europe can be booked for as low as $299 for a round-trip flight from Boston to Paris (CDG). 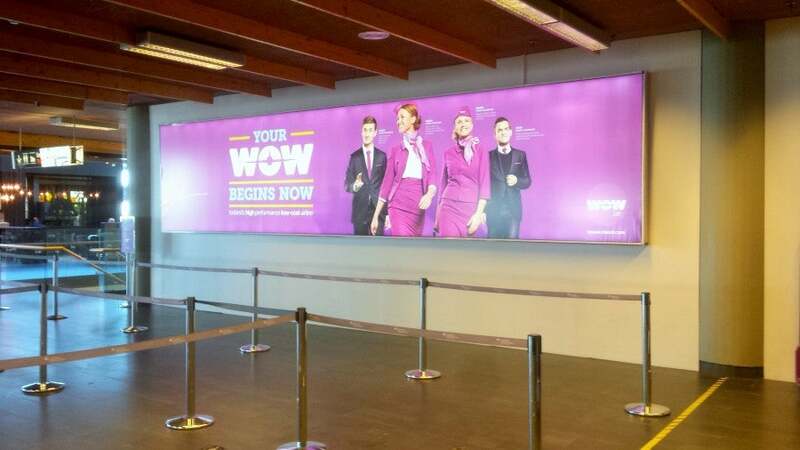 Note that all of WOW Air’s trips to Europe include an optional layover in Iceland; the longest layover I’ve seen is four days, providing a great opportunity to see a gorgeous country at no extra flight cost. If you have easy access to either Boston or Baltimore, I would say there’s tremendous value to be had in WOW Air. 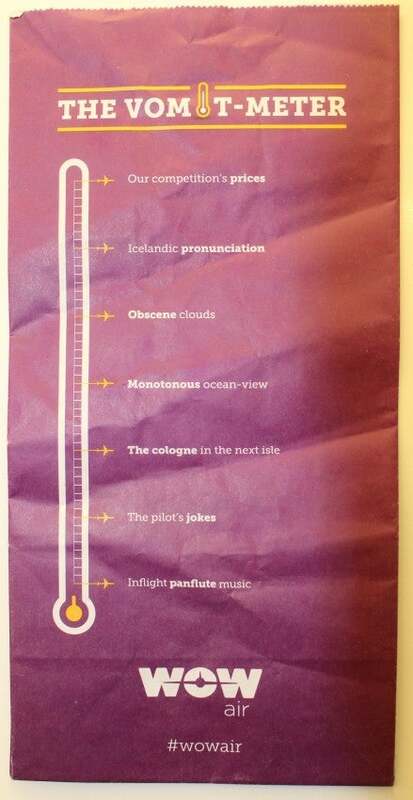 And if you’re planning a trip to Iceland, be sure to check out The WOW Air $99-Fare Guide to Iceland. Have you flown WOW Air? We’d love to hear your comments or questions below!